As you'll soon find, reading this poem is like being guided through a meditation, only instead of focusing on your breath, you're asked to embrace the radish. 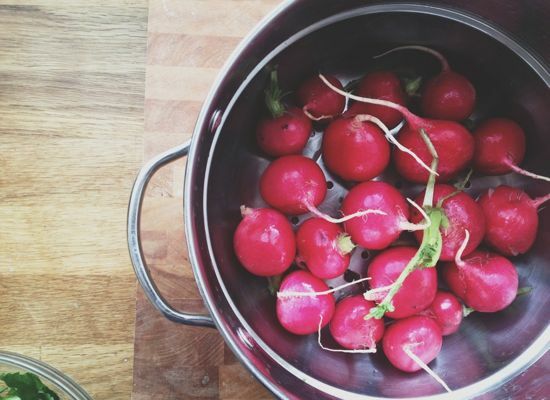 If you don't already adore radishes, reading this poem will make it nearly impossible not to. The radish, it seems, has done everything right. It comes in a variety of sizes and shapes, the "white of star" to the "plum flare / like a startled bird." They are easily pulled from the ground, offering themselves in our darkest season, yet we "hide them in salads," overlooking their "delicate sweetness" and versatility as more than just a garnish. and come up easily for us. they might as well be hidden. which of us has not done that? eat them in wedges with a portion of salt. to get back to that obsolete sweetness. "Black Radish" by Lisa Coffman, from Less Obvious Gods, forthcoming from Iris Press, Spring 2013. Reprinted with permission from the author. Now that we're sufficently enamored with the radish, I've taken a spicy, "nose to tail" approach with it, slicing it thinly, swirling the rounds in a peppery sauce, and adding in the greens to wilt at the last minute. It's a riff on the Italian "cheese and pepper" pasta, cacio e pepe. While we're on the subject, I should add that there are several absolutes when it comes to pasta. 1. You must salt your pasta water. Liberally. 2. You must save the starchy pasta water. 3. You must finish cooking your pasta in said pasta water. I hope you don't think I'm being pushy, but this is the difference between average and amazing pasta. Be warned. 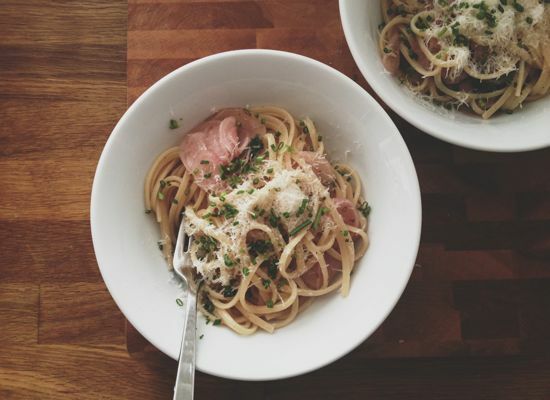 The half teaspoon of freshly cracked pepper makes for a spicy dish, but I like how it plays off of the Parmesan and tender noodles. I prefer pulverize whole peppercorns in a coffee grinder just before cooking, so the pepper is wonderfully fresh. Remove the radishes from their stems and trim the tails; thinly slice on a mandolin. Gently tear the leaves off and place in a bowl, discarding any that are too broken to salvage. Heat the oil over medium heat in a large sauté pan. 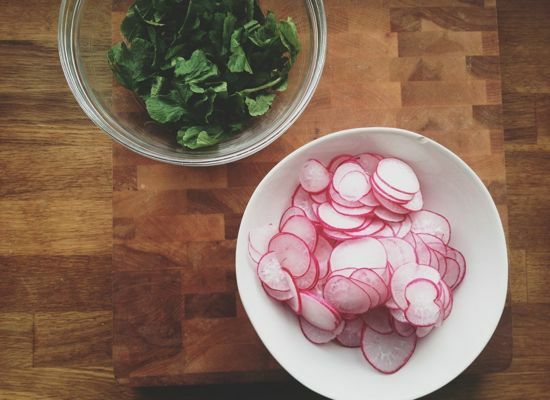 Add the pepper flakes and radishes, then season with 1/2 teaspoon salt and 1/2 teaspoon freshly cracked black pepper. Cook for 3-5 minutes, or until the radishes are translucent and beginning to turn golden brown. Add the radish leaves, stir to combine, and turn off the the stove. The residual heat will help them wilt. Cook the linguini in a large pot of boiling, salted water for 5-6 minutes. Drain in the sink, reserving 1-2 cups of cooking liquid. Add the noodles into the pan with the radishes along with a splash of cooking liquid, and bring to a boil. Add a tablespoon or two of Parmesan cheese, to. Continue cooking for 1-2 minutes, or until the linguini is perfectly tender and the noodles are coated in the luxurious sauce. Be sure to taste it now, and add up to an additional 1/2 teaspoon pepper depending on your preference. Plate, then garnish with additional Parmesan cheese and chives, if using.